As expected, Manny Machado’s return to the postseason was not without some controversial antics from the All-Star infielder. 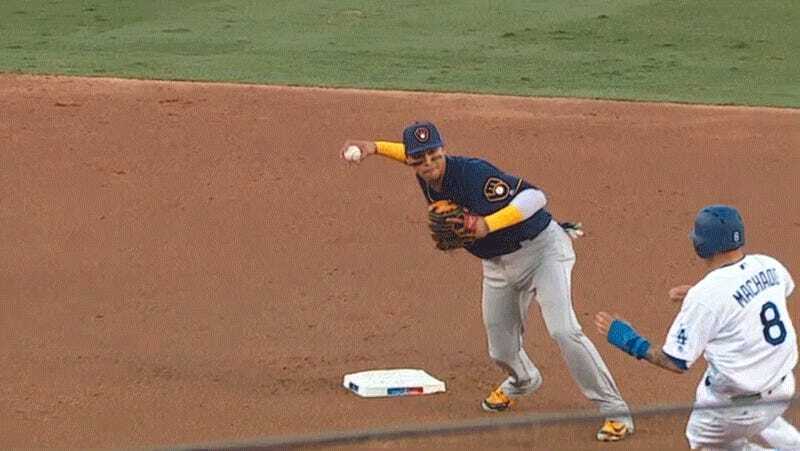 It all got started in the bottom of the second inning when Cody Bellinger grounded into what appeared to be a double play, but turned into a fielder’s choice because Brewers shortstop Orlando Arcia couldn’t get his throw off to first. John Smoltz on the broadcast argued that Arcia had jumped into Machado’s running path so even though contact was made, it couldn’t be considered interference. But Brewers manager Craig Counsell still came out to talk to the second base umpire after the play. Milwaukee would have another chance to argue a similar call in the bottom of the fourth when Bellinger once again grounded to second with Machado at first. Arcia was further off the base path this time, but Machado still made contact with his leg. 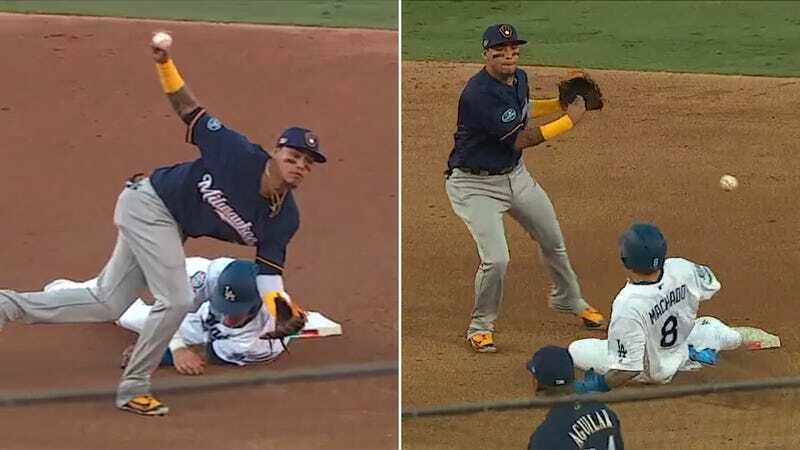 Though it was initially ruled another fielder’s choice, Counsell asked for a review of the play and the umpires reversed the call to a double play because of runner’s interference. This isn’t the first time Machado has gotten himself into some slide-related troubles. Last season, he slid into second base hard in a game against the Red Sox and ended up spiking Dustin Pedroia. A few days later, he was plunked by Boston pitcher Matt Barnes. While the contact may appear to be minimal, the ruling is consistent with the letter of the law. It’s not clear if Machado’s intentions were to stop both throws to first, but with the namesake of the “Utley rule” as his teammate, it might be tough to give him the benefit of the doubt. "Hold On, Hazel! I Had To Pee!"